Less developed regions make a vital contribution to national growth. During the dozen years prior to the crisis, regions with average GDP per capita below 75% of the national average accounted for 43% of aggregate growth across the OECD. In ten OECD countries (Austria, Belgium, Czech Republic, France, Norway, Portugal, the Slovak Republic, Sweden, United Kingdom and the United States), such regions accounted for over half of national growth. Rather than being a form of compensatory social policy, efforts to promote growth in poorer regions can form an important part of a growth-oriented economic strategy. Across the OECD area, predominantly rural regions have, on average, enjoyed faster growth than intermediate or urban regions with an average rate of growth of 2.33% for rural regions close to a city, 2.24% for rural remote regions as compared to the OECD average of 2.06% over 1995-2007. The widespread view that rural is all but synonymous with decline is not supported by the facts. That said, predominantly rural regions are disproportionately represented among both the best and worst performers. Overall, they simply exhibit greater variation in performance, suggesting that rural development does pose specific challenges. A corollary to this finding is that more densely populated regions do not necessarily grow faster. 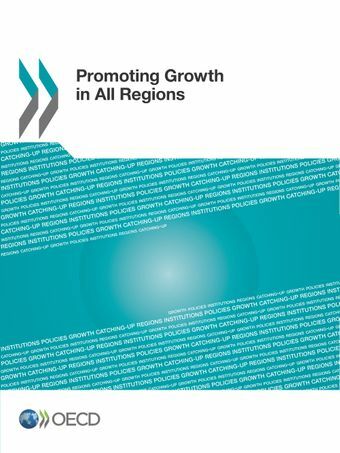 Predominantly urban regions grew on average (1.93%) slower than the OECD average (2.06%) with 58% of urban regions growing slower than on average all OECD regions. Concentration (of population or economic activity) is neither necessary nor sufficient for success. Broader-based growth brings other benefits in terms of equity, resiliency and fiscal health. “Catch-up” growth in poorer regions reduces the likelihood that individuals’ life chances are seriously damaged by where they happen to be born or where they live. Moreover, broader-based growth is likely to render economies less vulnerable to external shocks, while reducing the sometimes very large remediation costs that chronically under-performing regions can impose on national budgets. The barriers to growth regions must overcome vary widely. The key factors supporting regional growth are infrastructure, human capital, labour market, innovation, agglomeration and connectivity. For all types of regions, human capital appears to be the most critical factor. Of particular importance is reducing the proportion of people in a region with very low skills; this seems to matter more than increasing the proportion with very high skill levels. However, the relative importance of these factors depends largely on a region’s level of development. Successful performance may therefore require more than “one-size-fits-all” economy-wide policies. It is important to think in terms of policy packages rather than individual measures. Policy interventions can have unintended effects if undertaken in isolation. For example, improving human capital through training can simply generate a brain drain if not accompanied by policies that promote entrepreneurship and job-creation. Among the case study regions catching up around half engineered a simultaneous improvement in the policy environment, infrastructure and human capital. In similar fashion, improvements in transport infrastructure can prompt firms and workers to leave the region if not accompanied by measures to provide improve the local business environment. In one third of regions catching up around one third experienced a simultaneous improvement in infrastructure, the business environment and geographic factors. Policy synergies are key. Regions that are successfully converging towards national average income levels have mobilised their own assets and concentrated on co-ordinated improvements to connective infrastructure and human capital formation, reflecting the important complementarities that seem to exist among these growth factors.